Resources for teachers: SOS ! It is Science Fair Season! SOS ! It is Science Fair Season! Science Fairs may be very stressful for some parents who really want to get involved and help their child complete the whole project. Often, parents see science fair as too much work in their already busy life. For teachers, this activity is very time consuming especially with a very demanding curriculum. The solution? A project-based approach for teaching science is often the most natural way for lesson-planning. When science fair season approches, the students will already have the inquiry, research and design skills to carry out a project. 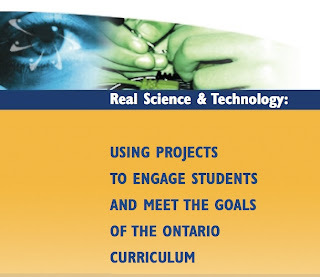 The document Using Projects to Engage Students and Meet the Goals of the Ontario Curriculum is all you need. It provides the theoratical ideas as well as worksheet and tips that may be used in the classroom.